When I was 26, I worked for an American waterski team as a professional waterskier. The company owns waterski shows based all over the world, and I was lucky enough to be sent to an amusement park in Germany. However, it didn't turn out the way I had expected. Allegra wondered why I even wanted to come back to the park, since all she had heard were bad things about waterskiing but good things about my german friends. I was both excited and apprehensive. 1987 had been a pivotal year for me in my life - not all of it good. But that's another story. One of the reasons we like having a car and taking our time to get to a destination is to go off the beaten track with no agenda. When you drive off the main highways, you never know what you will stumble upon. Touring through the Alps on a winding small motorway, we pulled off on the side of a lake for a picnic. We spied some wooden tables through the trees. 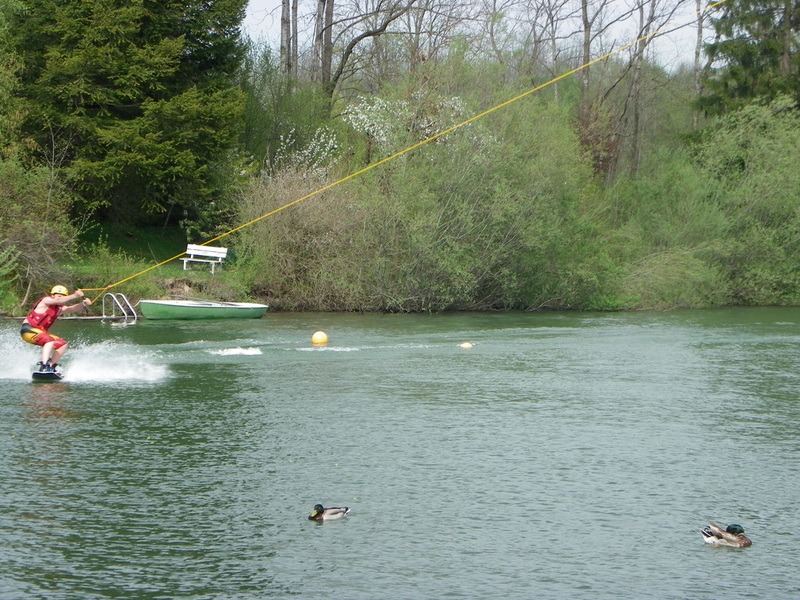 As we plopped down on a bench, a wakeboarder flipped in the air and landed just metres from the shore. Birch was very excited: we had come across a very cool lake with a pulley system for wakeboarders, waterskiers and wakesurfing - with no boats! For the next two hours, in freezing mountain water, Birch had a blast! There were all kinds of jumps and rails to push his skill level. P.S. Do you call it wakeboarding when there is no wake? Lichtenstein - Scary ghosts in the castle? On a gorgeous sunny day, coming out of the Italian alps, and travelling along valleys to Switzerland, we decided to have a picnic in Lichtenstein. It is quite beautiful: green, quiet, peaceful. Flowers everywhere. Whipping wind. As we climbed up the hill to the Gutenberg Castle, signage everywhere explained the multiple ghost stories that abound here. The more we read, the odder it felt. Then, Birch and Allegra . . .
_After a rather uncomfortable but inexpensive sleep we set off from our pull out north of Balzano and head towards Zurich in the early morning hours the next day. Taking one of the alternative roads into Switerland requires that we drive through an overpass. The drive is spectacular and nail-biting. The steep, winding and twisting road reveals spectacular views at each switch back and as we climb it gets colder and colder and soon we driving through snow covered scenery. Down the mountain pass and soon we arrive at the Swiss border. There is a border entrance with the tiny border buildings but no one is inside. The Swiss are not part of the European Union and I am ready with all our passports in hand but the border is un-manned and we get on our way. Driving in Switerland is candy for all the senses. Each small town is beautifully kept and you can see tiny villages nestled in the valleys surrounded by mountains. We decide to . . .
We arrive in Zurich and it is great to see our friend Franz. After warm embraces, we are shown to our own apartment. That's right - our own apartment! As luck would have it, Franz had a vacant apartment in which we could stay! We parked our new, new car and unloaded our gear and quickly got settled in. We open the door to the apartment and as we explore our new space, Birch and Allegra immediately find chocolate bunnies on the beds and are ecstatic. The bunnies were compliments of Franz's mom. We are then invited for a BBQ dinner at his parents' home just down the road. We had met his parents about seven years earlier while they were visiting in Canada. It is great seeing them again on their turf. We exchange stories and enjoy an excellent dinner together. Our time in Zurich was a good mix of . . . This is the fourth visit I have made to visit family in Slovenia. The last visit, seven years ago, was to see my grandmother before she passed on. Thankfully Birch and Allegra got a chance to meet her then: even though they were young at the time they do have a few memories of her. On the trip this year, I wanted to make sure that we all got down to Dubrovnik. I have always heard a lot about the walled city but never made the time to go. Well this time we did! We drove along the Croatian coast in our new, new car. We packed the car with all of our belongings and we are on our way. It is a little nerve racking in the beginning knowing the recent history with our new, new car. As we drive off . . .
met up with our parents, and we all went to the museum. There was this one room with a really old printing press, so we got a card printed as a reminder of this beautiful place. After that we . . .